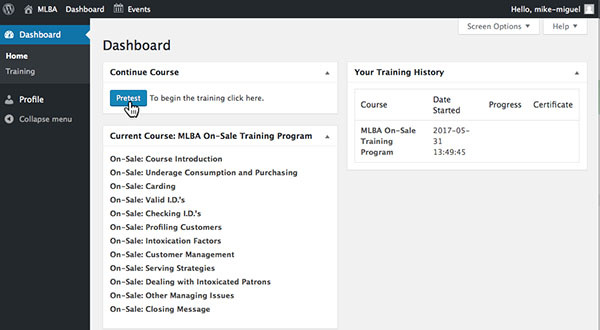 Note: if you have already taken the MLBA SALES Online course, you can skip this and login with the username and password you registered with before. Click here to go to the login page. 1. 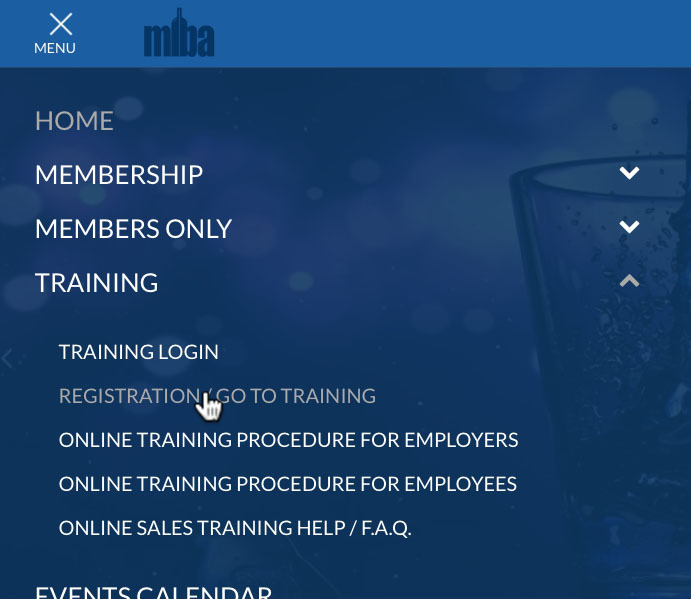 Go to MLBA.com and click on the “Menu” button in the upper left corner and then click on the arrow to the right of “Training” and then choose “Registration/Go to Training”. You will then want to click on the Training Registration button (if you haven’t already registered for a course). 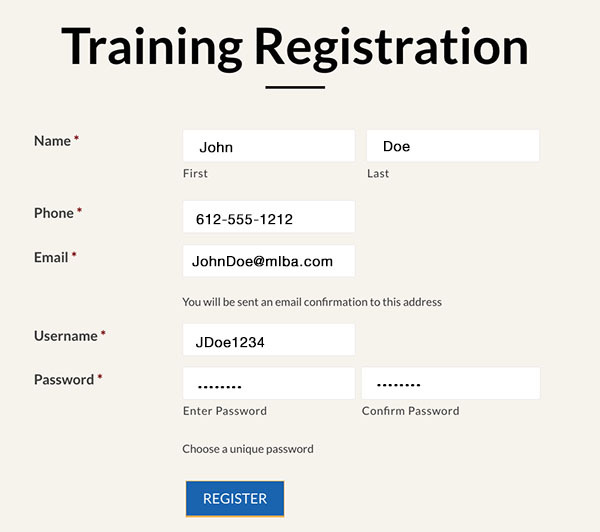 If you have registered previously, you can click on “Start Training” button and skip to step 3. 2. Fill out the registration form with your name, phone and email, as well as a “unique” username and password. You can use your email as your username if you so choose. Once the form is filled out, click “Register” at the bottom. 3. It will then ask what type of training course you would like to take, On-Sale for bartenders and waitstaff or Off-Sale for liquor store employees. Make sure you select the proper course, you cannot go back and change this selection. 1. 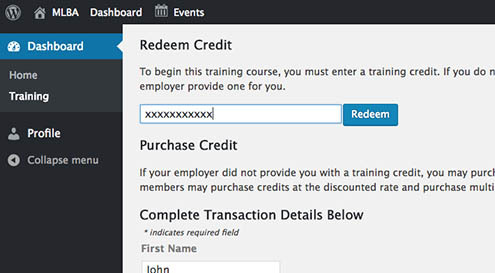 Once you have registered, chosen the type of training course (On- or Off-sale) and entered a training credit code, you will be taken back to your “Dashboard”. **If the Dashboard still says “Select Course” you may have to hit “Refresh” on your browser to bring up the “Continue Course” screen. To begin the training the click on the blue “Pre-Test” button. 2. The Pre-Test is around 30 questions and each question must be answered before you can move on to the first of 10 video segments. It does not matter if you do not know the answers to the pre-test, you will have a chance to answer the test questions again after each video segment, and again at the end. 4. Final Test: After the last of the video segments, you will take the final test. Each question must be answered correctly to pass the test. The training will take about 1 hour to complete. 5. Once all questions are answered correctly, the training returns to your “Dashboard”. You may print out a “Certificate of Completion” by clicking the link under “Your Training History”.